The two journal covers, the first featuring a cover image from the article by CHIRI researchers. 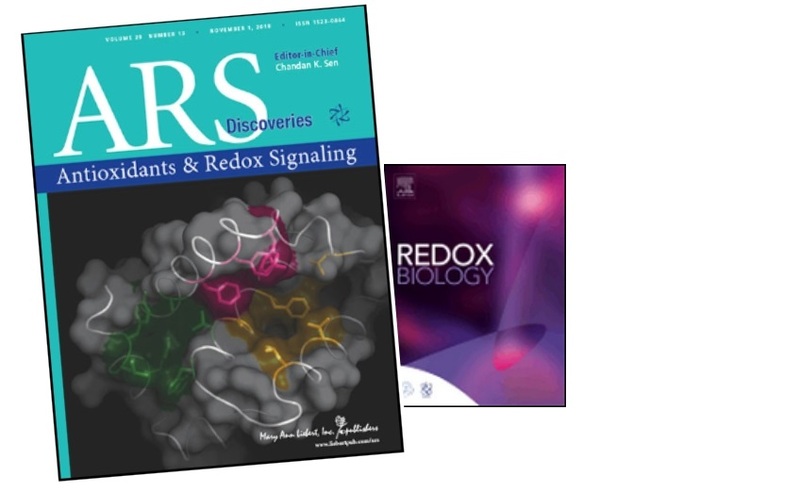 Former PhD student Dr Sebastian Pohl and his Curtin Health Innovation Research Institute (CHIRI) colleagues have recently had two articles published in premiere redox biology journals. Redox biology has been demonstrated to be critical in the understanding of cancer progression, as well as being studied in the development of therapeutics. Changes in the levels of different antioxidants within cancers cells can be both beneficial or detrimental for cancer growth. Sebastian was lead author of both articles, with contributions from two of his CHIRI co-supervisors Professor Arun Dharmarajan and Senior Research Fellow Dr Mark Agostino, in collaboration with Prof. Shazib Pervaiz (National University of Singapore). The first, “Cross Talk Between Cellular Redox State and the Antiapoptotic Protein Bcl-2“, was published in a Forum issue on Cell Fate Decision of the journal Antioxidants & Redox Signaling. The article is a comprehensive review covering the importance of cellular redox state in the activity of Bcl-2, which is a key cell survival protein and target of emerging anti-cancer therapeutics. Functional, structural, and pharmacological aspects of Bcl-2 regulation are described. An image from the review, prepared by Mark, features on the issue’s cover (see image above, taken from Figure 5 in the journal article). The second, “Gene expression analysis of heat-shock proteins and redox regulators reveals combinatorial prognostic markers in carcinomas of the gastrointestinal tract“, was accepted for publication in a special issue on Cell State and Fate in the journal Redox Biology. This study uses bioinformatic approaches to identify genes and gene combinations associated with survival outcomes in oesophageal, stomach, and colorectal carcinomas, which may be valuable as biomarkers or therapeutic targets in treating these cancers. Mark is the senior author of this article. Since finishing his PhD, Sebastian has taken up a postdoctoral appointment at the Institute of Genetics and Molecular Medicine at the University of Edinburgh. Working under Dr Kevin Myant, he is part of a research team focusing on colorectal stem cells and cancer research.